Any Hindu marriage will be incomplete without a Wedding Mandap as most of the rituals are performed in the mandap itself. A beautiful mandap is the main attraction of a wedding where the groom and the bride take vows around the sacred fire to get bonded with each other for the lifetime. A beautifully decorated mandap will enhance the wedding celebrations and will make your wedding ceremony an unforgettable one. 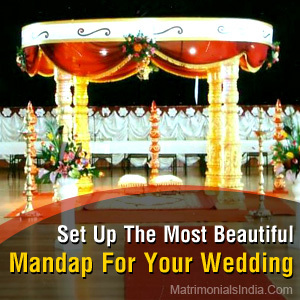 Different Types of Decorations For Your Wedding Mandap : While decorating the mandap you need to think of a theme as most of the wedding mandaps are theme based. Most of the decoration is either done with traditional colored red and golden draperies or either with beautiful flowers both fresh and artificial ones. The decorations done by the wedding planner are attractive and bright and are able to lure everyone's mind who is present at the wedding. Apart from this the decorations can also be done through decorative artifacts. Some of the wedding mandaps are also decorated by peacock feathers as well as flowers. Flowers like baby rose, orchid and lilies are in great demand while decorating wedding mandaps. Colors like mauve, peach, pink and sea greens are the prominent colors which are in great demand by those who are planning their wedding. Electrical garlands are replaced by lanterns and traditional candles. Netted silver drapes are immensely popular items for mandap decorations. If your wedding date is decided and you are confused that which theme you want for decorating your mandap, then the above article will give you a basic idea while you are planning your wedding theme. Your main motive is to make your one time experience a lifetime one and can cherish your memories in the years to come.